Erstes Mockup. Herr Grah bestellte ein Zifferblatt mit wilder Patina, eine Option, die ausserhalb des Customizer angefordert werden kann. 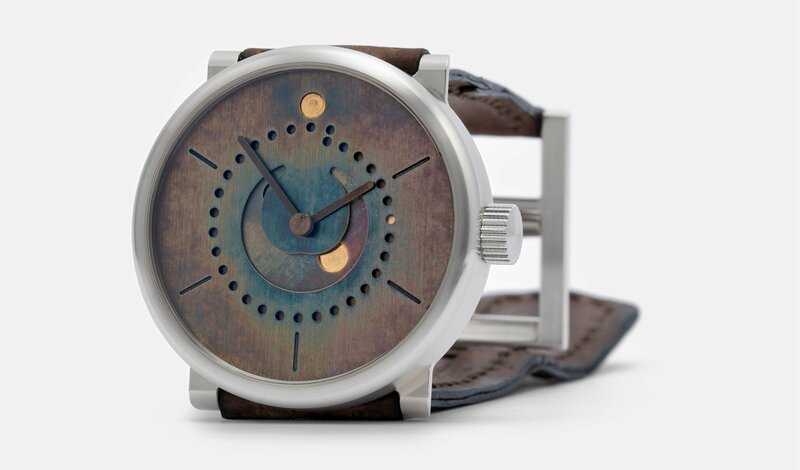 Die Uhr ist wirklich toll, auch wenn bei der wild patina die Vorstellungen von mir doch eher etwas blauer waren, bin ich glücklich. Es ist ein Unikat und daher einfach anders wie die auf der Homepage zu sehenden Bilder. Die Verarbeitung ist wirklich fantastisch und als Qualitäts-Ingenieur bei Porsche kann man das wirklich beurteilen. Da fasziniert einen jeder neuerliche Blick auf die Uhr mit Ihren fast nicht erkennbaren Bearbeitungsspuren, Fugen und Übergängen. Das kann man erst richtig nachvollziehen wenn man es in Echt vor sich hat. Und die Gravur ist perfekt. Richten Sie bitte allen bei Ochs und Junior meinen Dank für Ihre tolle Arbeit aus. Und einen besonderen Dank an Dr. Oechslin für Sein Genie und das er noch viele geniale Ideen ausbrütet. Grüße aus dem Schwabenland nach Luzern und wir freuen uns wenn wir die Uhr mal bei Ihnen vorbei bringen. UNITED KINGDOM—My journey began long before ochs und junior existed, in 1999. I discovered the ski region of Hoch-Ybrig, the Druesberghütte, and each month over the winter their „Vollmond“ Fondue evenings. A couple of years later I purchased my first moon phase watch in Einsiedeln. In 2016 I read an article in Quill & Pad and was immediately drawn to the simplicity and mathematical accuracy of the ochs und junior moon phase: I knew then that I would one day own one. When I first contacted Beat, I think in 2017, it was purely on an inquisitive basis: I was keen to understand the epicyclic gear train calculations. 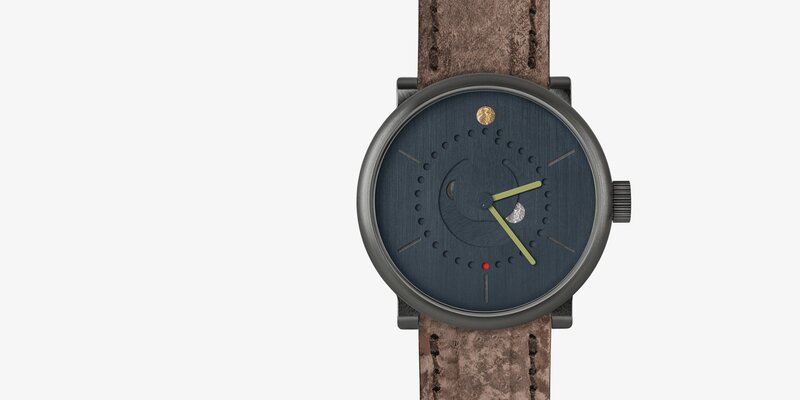 Ludwig’s calculation was willingly provided and the urge to own this watch was becoming stronger. 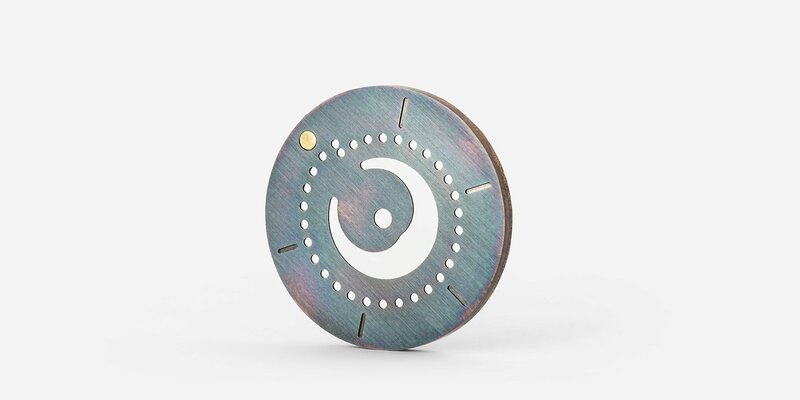 However, I still had a nagging question as to how the precise mathematical calculation manifested itself into the moon phase being presented on a disc which rotates once every 12 hours (through 6.0954°). A little time spent with an excel spreadsheet and everything became suddenly clear. It was that „light-bulb“ moment, and the brilliant elegance of Ludwig’s design became apparent. From month to lunar month, there are tiny variations in the depiction of the full moon, no more (and frequently much less) than -3°/+3° either side of the 6 o’clock position…and the width of the 15th date dot, at the 6 o’clock position: precisely 6° – perfect. From here there was no turning back: I had to own this watch! 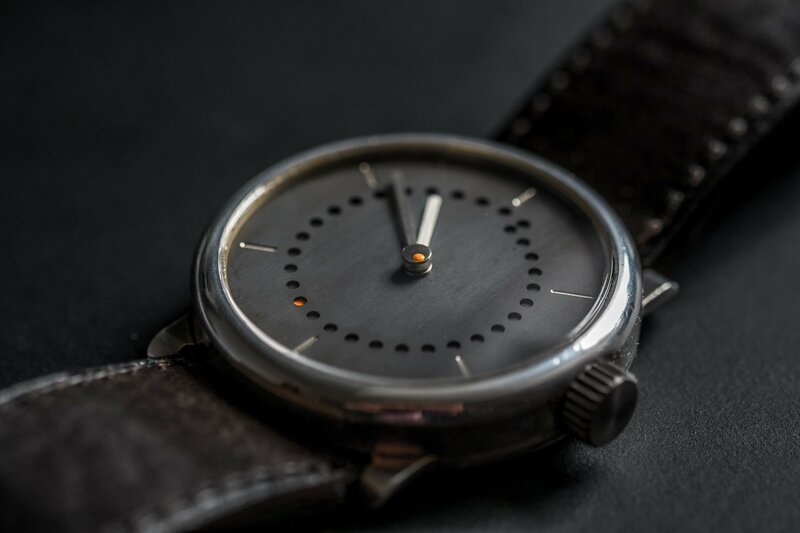 I visited Beat at the OJ workshop in early May to discuss the design of my watch. The customizer is a great tool, and the many high resolution images on the website provide further insight into how your watch will appear. But nothing compares with holding these watches in your hand and seeing the effect of the sunlight on the patinated dial and discs. Besides, you get to meet Beat and try out the excellent expresso! 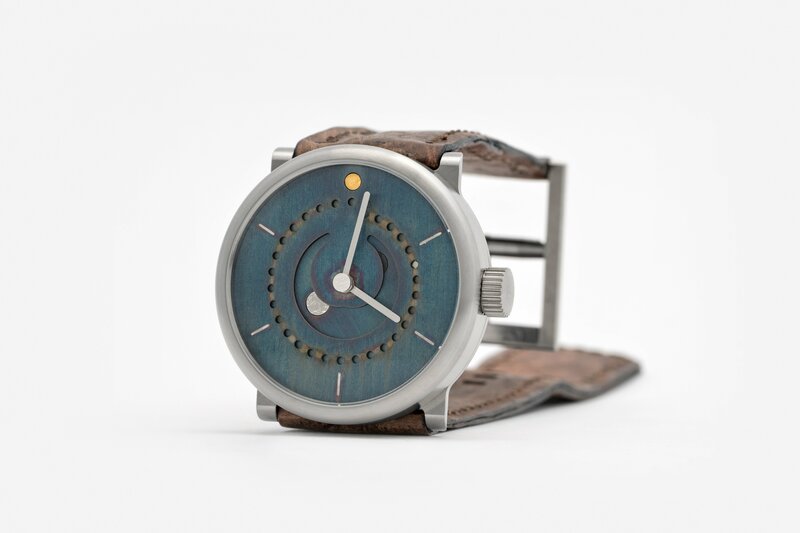 We discussed my initial design, which changed slightly as I had originally thought I would need to achieve a contrast with grey patinated discs and a blue patinated dial. Nothing was too much trouble for Beat, and there was always an example available to hold and view: I settled on blue patination throughout which looked fantastic in natural light. Every question was eagerly answered, including an explanation of the ingenious mechanism by which the moon disc is held firm during the 10 hours or so each 12 when the central finger is not located in the gear train. 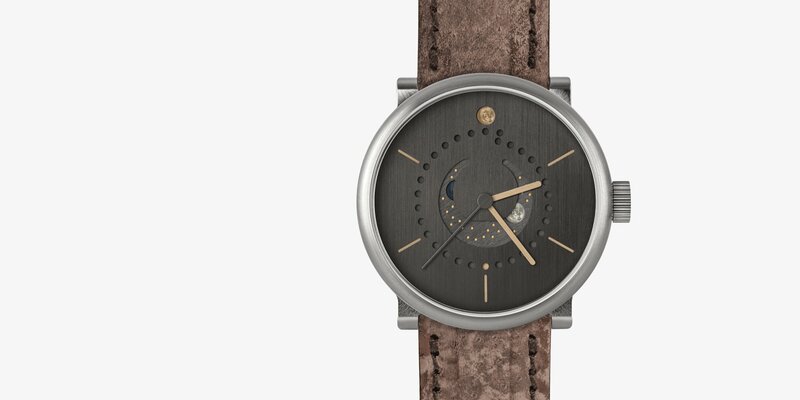 And then came the little smile from Beat, when I made my ’special‘ request: to have three milled markers added, two on the dial 6° apart at the 6 o’clock position, and one on the moon disc at the precise point of the full moon. The geek in me wants to be able to observe the tiny variations referred to above each month at full moon. 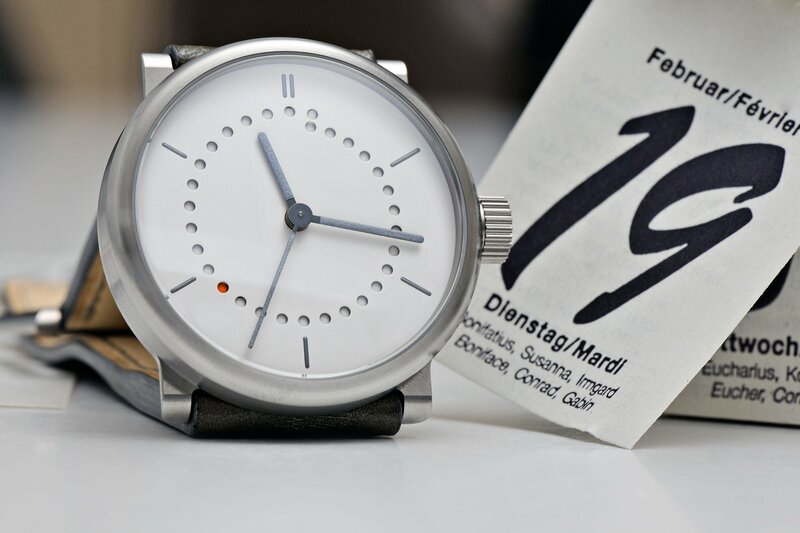 Of course this could be accommodated: each watch is manufactured to order and is unique, just like each customer! And so the journey continued, Peter Cantieni’s CAD diagram arrived in my inbox, the three unique markers would be milled at the narrowest possible width of just 0.15mm, allowing visualization of the tiny variations of the Full Moon position each month. And as I left the workshop, I couldn’t resist asking about Ludwig’s current projects…my lips are sealed! 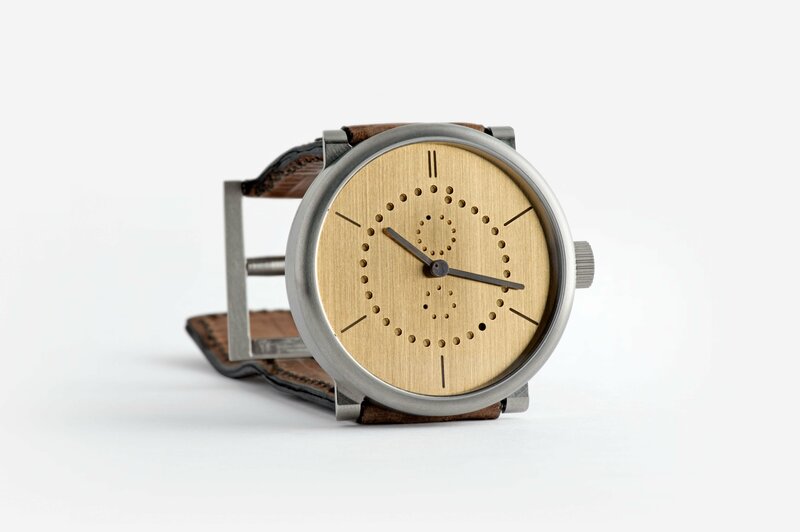 COLORADO—I have always wondered why certain people are so fascinated by mechanical timepieces. I know for me it started when I was really young and my grandfather collected mechanical clocks. I also remember not really understanding him when he would talk about how they worked or how each one was different. It wasn’t until later in life that I started to really understand what he was saying and how he felt. And I probably didn’t fully appreciate it until I dissembled and reassembled my first movement. I own a small watch company so I am very picky about what I add to my private collection. I chose an ochs und junior timepiece for many reasons. I tend to like simple, clean designs and appreciate the engineering involved in making something complex more simple. I also feel that ochs und junior watches excel at blending the various design elements of the watch in harmony. 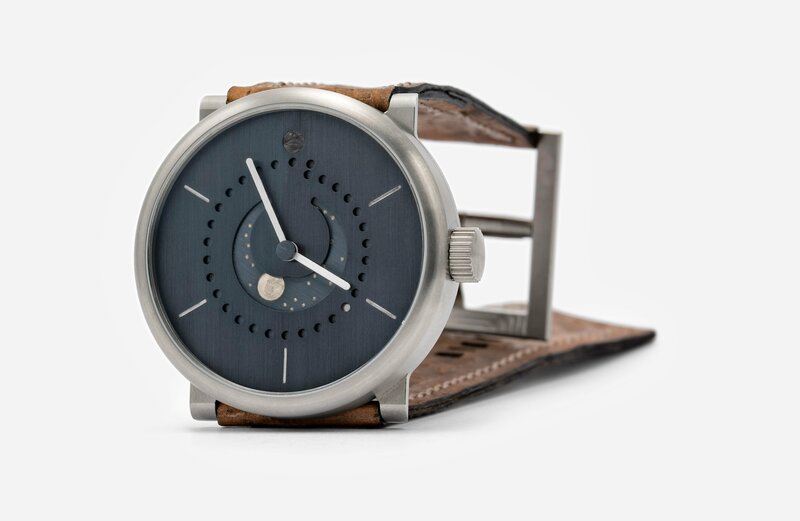 The design flows seamlessly from the titanium case to the brushed dial and hands all the way through to the unique sturgeon strap. The highlight being how the light plays off the brushed dial. I also appreciate the unique and uncommon nature of watches from some smaller companies. 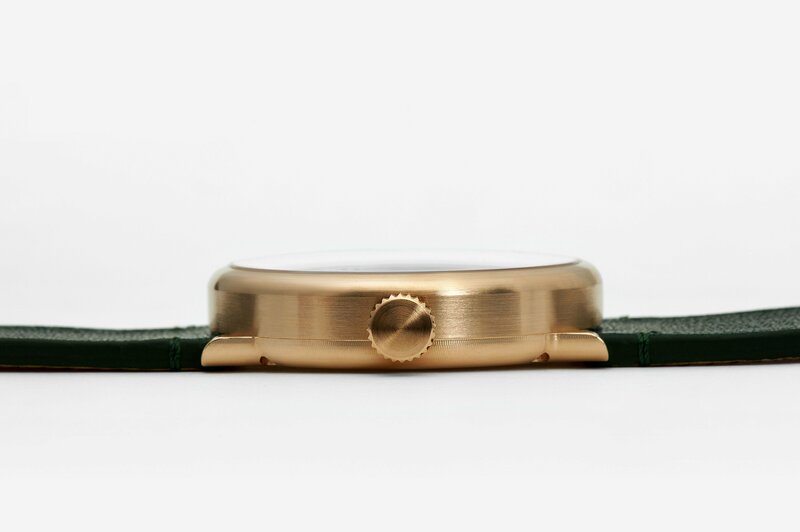 The customer service with ochs und junior and the communication while designing and building the watch was a real pleasure. Mr. Weinmann was very responsive and easy to communicate with. Dr. Oechslin’s history in both horology and watchmaking speaks for itself and this was a very big part of why I chose one of their timepieces. I think that history shows in all aspects of the company. I will proudly wear my ochs und junior annual calendar knowing that the same passion I have for mechanical timepieces is also shared by the people who helped me build such a special and unique watch. LOS GATOS, CA—After learning about ochs und junior, in particular the moon phase, it took me about five seconds to decide I wanted one. In my own business, I always try to find simple solutions to complex problems, and ochs und junior clearly shares that ethos to an extreme degree. Committing to buy one of their watches wasn’t easy. Spending that much money on something I couldn’t even see until after I’d bought it was an exercise in trust I wasn’t sure I could manage. Once the decision to buy had been made, I was left with the far more difficult task of designing what I actually wanted. To that end, I sent at least one email per day for a month to Beat. Sometimes I’d make small changes, and still other times I’d make simply insane requests. No matter what I suggested, Beat would show me a mock up or reign me back into reality, sometimes both. What I learned from that process is that ochs und junior is incredibly willing to try new things. For instance, I don’t really care for seconds hands on watches, but I recognize their necessity on a moon phase. I asked if they could mill an impossibly fine, almost invisible line into the seconds disk, something that I wouldn’t see unless I was looking for it. Of all the customization I wanted, this was the one aspect I was least sure could be accomplished in a way that met my expectation. I was shown a picture of the bare brass piece, and my apprehension only grew. When my watch arrived, the seconds disk was the first thing I checked, and it was perfect. The final product is better than what I’d first imagined, and it makes me smile every time I look at it. Along that theme, the pictures on the website and in reviews in no way do justice to the quality of these watches. Looking at mine, it feels like it’s something completely different with every change in angle or lighting. The grain in the patinated brass can sit cold and unyielding, then, with the slightest flick of the wrist, explode light and color. For a watch that presents as plain on a computer screen, it has more depth and facets than any other that I have seen in person. Many of the reviews talk about the raw nature of the cases because of the visible machining marks. That sounds nice in print, but it’s an incomplete appraisal. In the metal, the markings are as precise and crisp as any Côtes de Genève, only more unique and subtle. While it’s certainly a different type of finishing, to call it unfinished is to miss the point. All of my other watches came with some degree of buyer’s remorse or maybe Catholic guilt after I’d brought them home. This is my first watch that feels wholly right and justified, which I credit to the team’s ability to build something that is as perfect a representation of me as is likely possible. CALIFORNIA—It is significantly more difficult to design a simple solution than a complex one. I work in Internet infrastructure for Google, so I deal with very large-scale critical systems on a daily basis. In my line of business the first solutions that come to mind for engineering problems are typically the most complex ones – it takes a lot of engineering brilliance and experience from our teams to be able to deconstruct down to a simple solution. After dealing with 15 years of operational challenges I’ve come to know that having more moving parts means more things that can go wrong. For the stability and reliability of the system it is incredibly important to reduce the number of dependencies and subsystems. I was fascinated to come across a watch company where their master watch maker has the same design philosophy – simplicity. Wearing an ochs und junior timepiece is a constant reminder for me to strive for higher reliability in the systems I work with. ANNAPOLIS, USA—For me, the main attraction of the watch is that one of the great horological minds of our time has placed within reach a far more precise timepiece – in terms of the accuracy of the moon-phase display – than any other watch. I can afford this extraordinary precision thanks purely to the simplicity of the design. By extension, the dial’s visual simplicity also has a practical effect: I am able to learn what the date is without the need to read a number. In this age of digits, it is an innovation of an old-fashioned sort, and it gives me joy. Then there are of course the aesthetic rewards of simplicity. 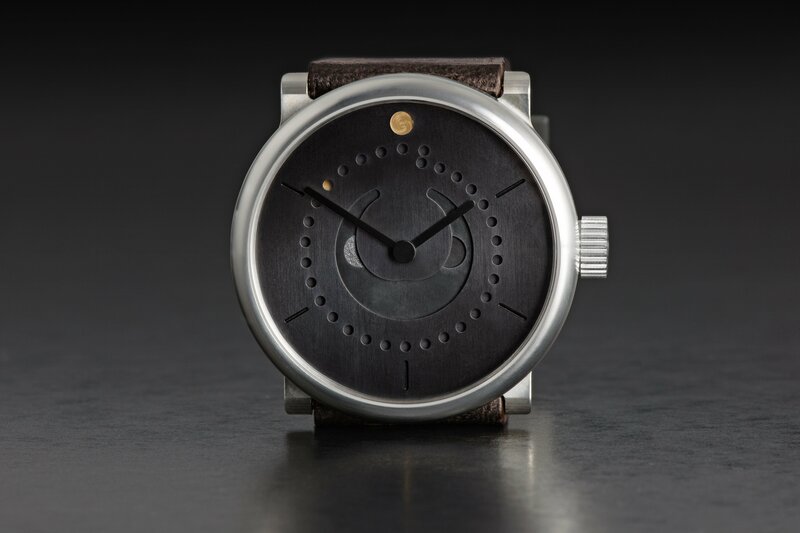 The dial is brilliant: with its subtle date spiral, and the “horse shoe” that shows not only the sun-reflected moon but also the dark side. I find it satisfying that the watch has a couple of complications, and offers them while refusing to give up an iota of clarity. The result is a watch that tells me the time at a glance, even when I am not wearing reading glasses, and representing also my own choices and ideas, is unique and uniquely mine. In addition to ox-strength horology, there was also the role you played, Beat, on that crystal-clear summer’s day in Lucerne that made getting this watch special. You asked all the right questions, listened to my vision, and improved it by suggesting the sun dot at twelve o’clock should be not just gold but polished, sunny gold. You had earlier arranged for me to have a little extra time in Lucerne, and after lunch you made sure I knew how to get to the wounded lion and to the glorious panorama. You gave me a memorable day! THE NETHERLANDS—My moon phase is still something special. It represents for me many things. It reminds me to use my creativity and to value all what excels in simplicity. No matter how big or small, the understanding that simple is most of the time the hardest and requires understanding of the complexity at first, is very useful in my daily work as a consultant in the field of organizational development. LOS ANGELES, USA—ochs und junior highlights the best of this industry. They are a brand that has a clear ethos and sticks to it. Everything is natural and cohesive. It is a watch with integrity. 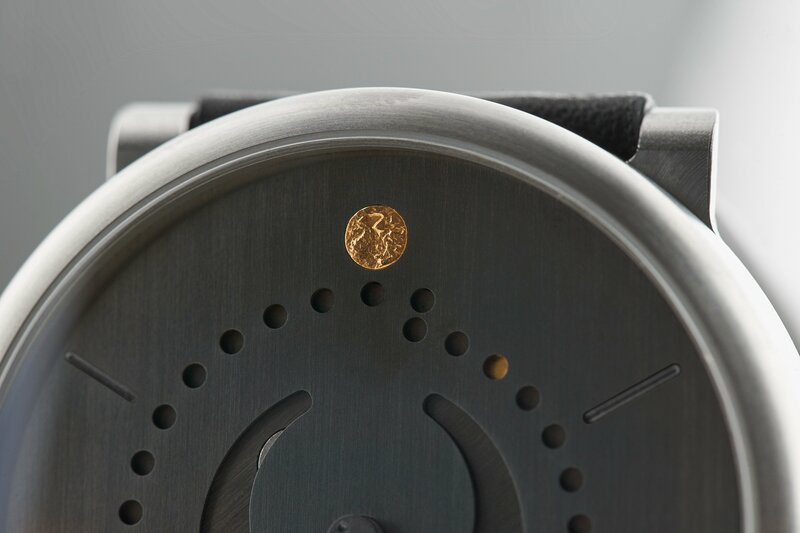 This allows it to simultaneously be successful as a piece of art, design, mechanical engineering and horology. To own an ochs und junior is to stand up for things being done the way they ought to be. Plus they know how to make a proper espresso! PORTUGAL—When I discovered ochs und junior, what struck me the most, apart from Ludwig Oechslin’s genius and ‘Simplicity is the ultimate sophistication’, was the possibility of having a say in ‘my’ watch. So when in the first mail I asked about the possibility of having one made in bronze I was surprised at getting a call from Beat within a few minutes, telling me they had had the material in stock for a few weeks and were just waiting for the first customer to ask for it. What a coincidence and what fun being able to choose the design to my liking! That’s really half of the fun, the other one is using it. And this is one, which will certainly stay until I pass it along to another generation. WOLFSBURG, DEUTSCHLAND—Meine Liebe zu Euren Uhren wurde 2010 geboren, als ich zufällig in einer Uhrenzeitung auf Euch gestoßen bin. Zu der Zeit war ich noch großer Freund und Sammler klassischer Uhren. Angekündigt war damals die Mese, die mich mit ihrem puristischen Design und dem unglaublichen Kalender sofort in ihren Bann gezogen hat. Die Korrespondenz, aber auch die Besuche in Luzern – damals noch nicht im Ochsenloft – haben ihr übriges getan. Entschieden habe ich mich für die ganz puristische Version in Silber mit Zeigern und Zifferblatt aus Weissgold. Das ist nun über 5 Jahre her und ich habe die Entscheidung nie bereut. Gefreut hatte ich mich von Anfang an auf die zu erwartende Patina des Silbergehäuses – und tatsächlich, das Gehäuse entwickelt eine wunderschöne Patina in den geschützteren Bereichen in Verbindung mit Hochglanzstellen. Nach wie vor ist die Uhr ein Traum und ein Schmuckstück. Im Laufe der Jahre durfte ich dann noch den ganz besonderen Service in Anspruch nehmen – die ursprünglich in Titan ausgeführten Teile (Krone und Schließe) wurden nach und nach gegen silberne Teile getauscht, so dass die Uhr heute komplett stimmig und rund ist. Abgesehen davon konnten wir diese Gelegenheiten immer mit sehr netten Besuchen – bereits im Ochsenloft dann – in Luzern verbinden. 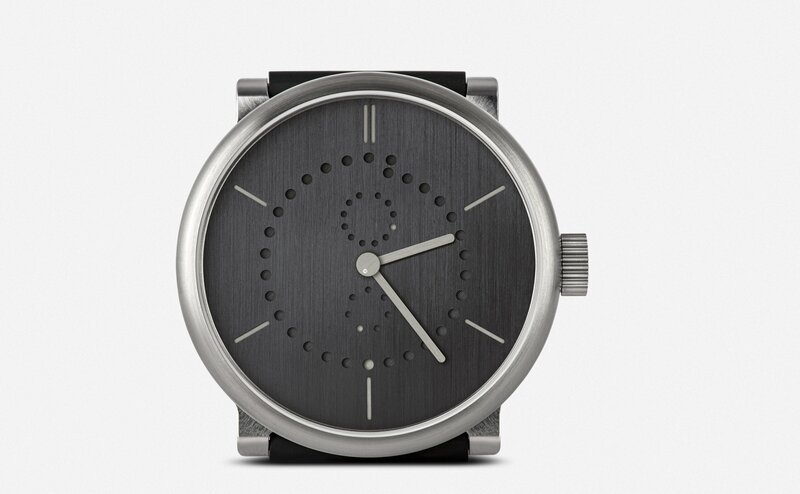 THE NETHERLANDS—For me ochs und junior is more than just a watch company. The design philosophy is also a source of inspiration for my daily business life. Both the challenge to make a function work with as few parts as possible and the way Ludwig finds a different way to show various instances of time again and again. So simple, even for a child. After I told my daughter on the 7th of June that her birthday would be at the 25th dot, she started to count the dots and was a bit disappointed that it would take 18 more nights. But it gave her a much better idea of the time span than a digital date would have provided. In the online maps where I try to visualise traffic congestion and traffic accidents, I try to show as little as possible, but enough to tell the right story. In that approach I recognize a little part of the ochs und junior philosophy of creating beautiful, yet simple timepieces. CALIFORNIA, USA—Ich sammle authentische, mechanische Uhren und finde deshalb die augenblickliche Retro-Manie peinlich. Ebenso wie die überladenen bzw. skelettierten Zifferblätter. Dann entdeckte ich die ochs und junior mit einem visuell faszinierenden Ganzjahreskalender – das Zifferblatt könnte auch eine abstrakte Grafik sein – und der Möglichkeit, mit dem Online-Konfigurator mir meine ganz persönliche Uhr zu gestalten. 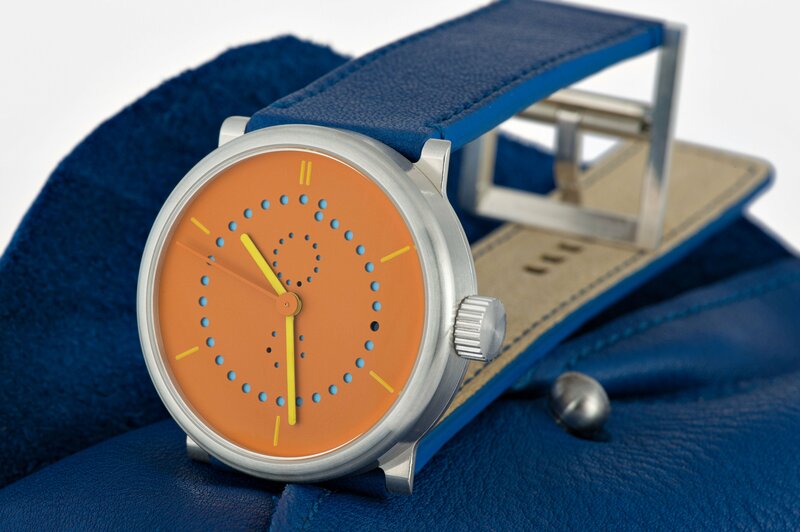 Kein Geheimnis: Ich liebe Farben, und zusammen mit der weichen Anmutung des Sterlingsilbers machen das warme Gelb und das frische Blau die Uhr einfach cool – wer immer sie sieht, sagt: ‚WOW SHOW ME!‘, und geht mit einem Lächeln weiter. 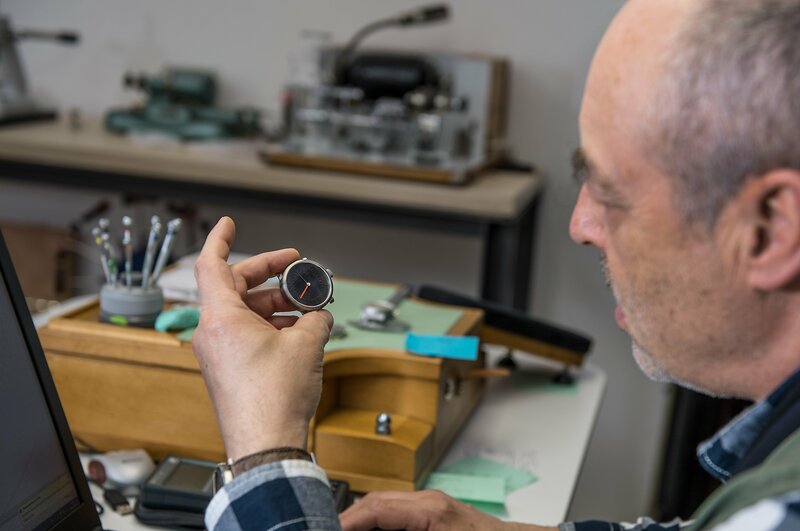 NEW YORK, USA—Ludwig Oechslin might just be the greatest watchmaker you’ve never heard of, and his ochs und junior line of handmade timepieces might just create an entirely new segment of ‘anti-luxury’ watches. Devoid of the ‘complications for complications sake’ mantra that has permeated the Swiss watch industry over the past decade, the Lucerne-based horologist offers the full range of Pantone colors for the watch’s dial and hands, giving customers numerous options. Coupling bespoke design with the brilliant functional simplicity of cogs and wheels (instead of the more volatile levers and switches), ochs und junior sets a new standard for both customization and technical precision. I was so impressed by what Oechslin offers that when I wanted to celebrate five years covering the watch industry, I did so with an ochs und junior timepiece. As an expression of gratitude to our audience, HODINKEE gave the watch to one of our readers; we selected a timepiece that represented not only ourselves, but what we thought was the very best that this industry could do. As someone who owns watches from dozens of manufactures in a range of vintages and price points, I can say there isn’t a single more satisfying timepiece to wear than an ochs und junior – it makes you feel like, for once, you’re part of the solution, not the problem.